Critical Practice has invited Basekamp to be a “stall holder” in its upcoming “P2P exchange” in the broad framework of “The Truth is Concrete” marathon in Graz, Austria. Using a flea-market-like model of association, where each contributor/group occupies a simple “stall”, The Truth is Concrete’s General Assembly will be transformed into a network of exchange. Here the Marathon’s publics will wander from stall to stall, perhaps loitering at some, perhaps humpfing off after arguments at others, but by and large engaging in reciprocal, intimate, simultaneous and distributed conversations, discussions and debate. 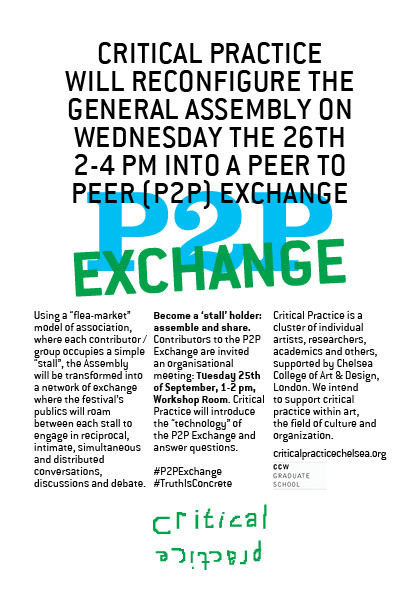 Like other contributors to the P2P Exchange, Basekamp is invited an organizational meeting on Tuesday 25th of September, 1-2 pm, in The Truth is Concrete’s Workshop Room. Critical Practice will introduce the “technology” of the P2P Exchange and field questions. 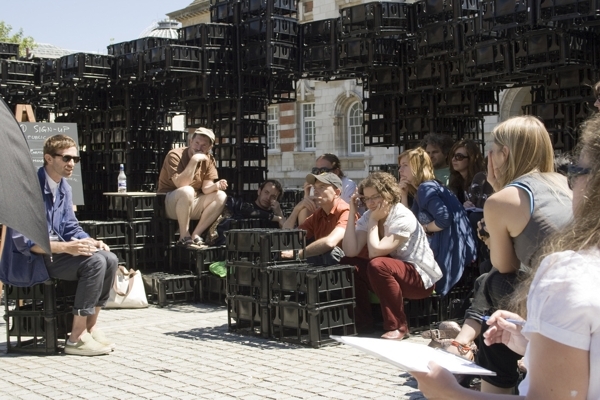 Critical Practice is a cluster of individual artists, researchers, academics and others, supported by Chelsea College of Art & Design, London, involved in what in Plausible Artworlds’ slang we called (before abandoning typologizing altogether) “organisational art practices”. For a better idea, see: http://criticalpracticechelsea.org. 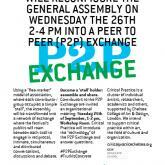 Hash tags: #P2PExchange and #TruthIsConcrete on Twitter. If you’re in or around Graz this week, please join us!